On November 12th, “Hunger Games” star Willow Shields (“Primrose Everdeen”) visited Benito Juarez High School in Chicago as a thank you to the students for their excellent participation in Chicago Public Library initiatives and YALSA’s Teen Read week. “I am home schooled so it was weird to be at a school again. I got to encourage the students to read more. I owe some of my success to the fact that I love reading. I read constantly. It helps so much,” said Shields to Lawndale News. Shields also participated in a Q&A with the students before a presentation of “The Hunger Games: Catching Fire.” Several lucky students also went home with prizes from “The Hunger Games: Mockingjay – Part 1” including tickets to an advance screening taking place before the movie opens to the public on Nov. 21.
wings as she fights to save Peeta (Josh Hutcherson) and a nation moved by her courage. “She [Primrose] starts off as a young girl that is scared and discovers who she is as a person. 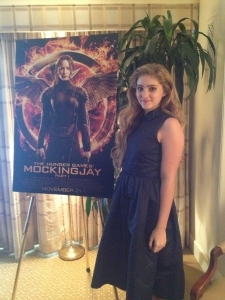 In Mockingjay she finds a lot of strength in herself,” said Shields regarding her role as Primrose. In terms of Chicago, Shields said that not only is her dad a native of the Windy City but also that she enjoys and misses the cold. “I love Chicago,” she said. © 5789 Chicago Hispanic Newspaper, Lawndale News, Hispanic Bilingual Newspapers, Su Noticiero Bilingue. All rights reserved. XHTML / CSS Valid.